1920's to '40's roots swing music with a peppering of country music, lush harmonies, and ear twisting arrangements is what this fabulous six piece band delivers. "The Sunnyside of Life" is a collection of old time music, old and new country tunes, and a peppering of 1920's and 30's jazz standards. 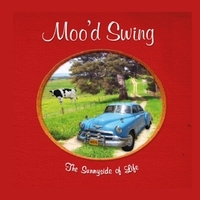 Moo’d Swing makes this collection of songs their own by including three-part harmony singing and playing on a wide range of instruments. Their arrangements are unique which puts a whole new spin on these ol’ classics.